Before blogging, I pretty much skipped out on the Halloween decor. Can you believe that?! Especially with as much as I love to decorate! I only had 2 Halloween guys that I put out with my fall leaves and pumpkins, that's it! What was I thinking?! In part it was pure laziness purely to save time. I have lots of fall pumpkin/leafy stuff that works from September through Thanksgiving so that's just what I did. Now, after looking at all the great Halloween stuff for the past several weeks I have been inspired to create. However, my inspirational feelings did not bring about lots of inspirational money to blow on Halloween. So, I did what any good and thrifty blogger would do... I hit the dollar store. 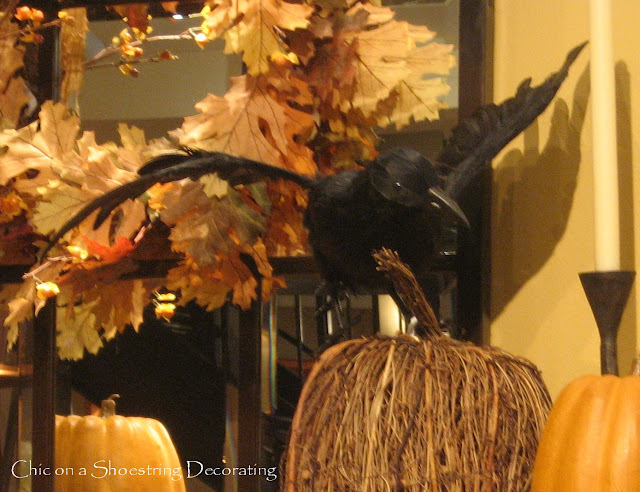 Many of you have seen "the birds" that are all the rage in Halloween decor this year. Check out these Black Birds from the Dollar Store... I was so impressed that they had 2 different birds in 2 different positions! Mr. Fancy-Pants black bird cost $29.50! Yes, almost $30 for a fake black bird! Yes, he's a little bigger than my dollar store birds and yes, he is "flying" as opposed to just sitting there like his cousin but... $29.50?! C'mon Pottery Barn, he's not worth $28.50 more than his cousin. I know I'm coming down a little hard on Pottery Barn but I really do love them. They have just dreamy fall and Halloween decor this season (along with everything else). They are one of my greatest inspirational stores. They can just be a little (or a lot!) pricey. So, no offense dear Pottery Barn. Back to my mantel... I picked up 5 black birds and a bag of fake spider webbing for a total of $6. I really like how it turned out (especially for only $6 buck-a-roos!) What do you guys think? It looks great. It is amazing how a few small additions can really jazz up your house for each season. I love it! Gotta love the dollar store. I was like you, I had one or two pumpkins that I would use, maybe, and that was it for Halloween. Now, this year, since I started blogging, I am out of control with inspiring crafts and decor!! It is so much fun! LOVE it. I didn't really do all this fall decor stuff either. It is all of blog lands fault for sure. I have several of their cousins on my mantle too! The Dollar Store is fantastic! Love your mantle! it looks spookily spectacular.. I'm bookmarking this to show the little neighbor girls when they come to visit.. they will LOVE it..
Well Done! I love the pewterish colored pumpkin also. I thought PB hit a new level of ridiculous with the price of the chalkboard rocks but a $30 bird beats that one...I like your $1 bird just as much as theirs. Good Job! Beautiful job on your mantel. Thanks for sharing. Your mantel is looking great! I love the spider webs on the mirror. How did you get your pumpkin looking gilded? It is beautiful. Come by and visit, I am having my first giveaway! These are awesome! I am going to the dollar store tomorrow. What a great change on your mantel...Love that it is all black...and the blackbirds are so cool! Your mantel looks great! I think it looks better than Pottery Barn. Your plate looks great too, is that Johnson Brothers? I LOVE the black and white. And, I agree about the Dollar Store, it's a great place to shop. I once read a post and she said she challenges herself to spend only $5 and see how creative she can be. I've tried it and it's loads of fun. In fact, I think I need to go by there tomorrow and see if I can find anything I "need"! Thanks so much for sharing! I agree with you about Pottery Barns prices, but I do love their things. You did a great job! Very fabulous! The best black and white that I have seen for Halloween. Great job! Oh I adore this makeover. It is spooktacular. love what you did with your mantle to spook it up. i don't have a mantle, but i decorated my dining room table halloween style. i call it pottery barn a la dollar tree and christmas tree shops. i'll be linking it to your party on fri, too! Great mantle! Love the birds... I will have to check out my dollar store, I've been looking for some as well! Well I'm not much of a Halloween decorator either but what you have done is just perfect for those with an aversion to Halloween decorating. I too picked up several of the dollar store birds, love them. Oh and I have that same plate on my mantel right now, great minds think alike I guess. it looks great!! it's my favorite halloween style i like to call spooky chic! thanks so much for linking up and sharing with us!! Welcome to the other side of fall! 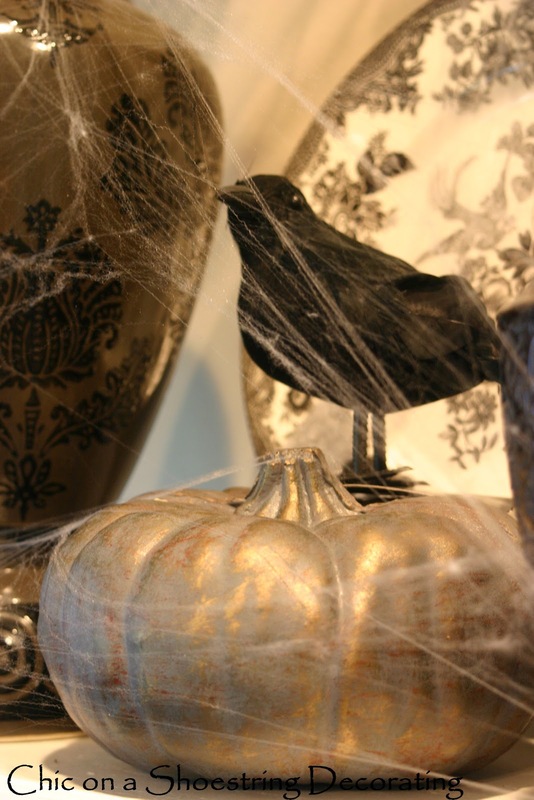 Decorating for halloween can be fun and so many out of the ordinary things can be done! I started to decorate for halloween for the kids and now more just for the fun of coming up with new ideas. Great mantle. Very nice! Like the metallic pumpkin too. YOur mantel is beautiful. I've picked up a few of these birds at dollar tree this year among other things. 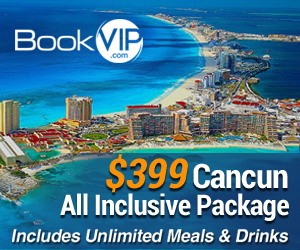 They have such great stuff and can't beat the price! Your mantel turned out so elegant for such a spooky theme!!! Cheers to you! I love, love, love a fabulous decorating idea for less! Your mantle looks great for the Halloween season! Love your creativity! Yes, sometimes the absurd pricing out in the retail world just cracks me up. I'm always looking for ways to do things cheaper without looking cheap, you know what I mean? Your decor is gorgeous. Although I love the colors of Fall, I am not one who decorates for Halloween. So much of seems more for kids. But THIS - well this is by far my favorite Halloween decor project EVER!! It looks spooky, and real, and has nothing to do with jack-o-lanterns, trick-or-treat, or witches. LOVE IT!! LOVE, LOVE, LOVE your mantel!!! I think it might be my favorite Halloween mantel yet!! Great job!!!! 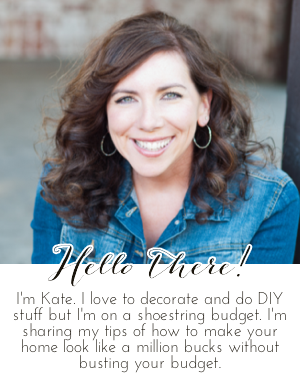 This is my first fall as a blogger too and I love your mantel! I like to decorate with things found at the dollar store too! I found your link from Its So Very Cheri. I saw your link on Its So Very Cheri and loved it! Your mantel is so spooky but in an elegant way! So chic...on a shoestring to boot :)! Thanks for linking up! It looks fantastic! The best part of holiday decorating is NOT having to dust. But I always just say that dust is a protective covering on my fine antiques. If I had fine antiques. I'm going to have to buzz on over to Dollar Tree and soon. Love this spooky mantel! 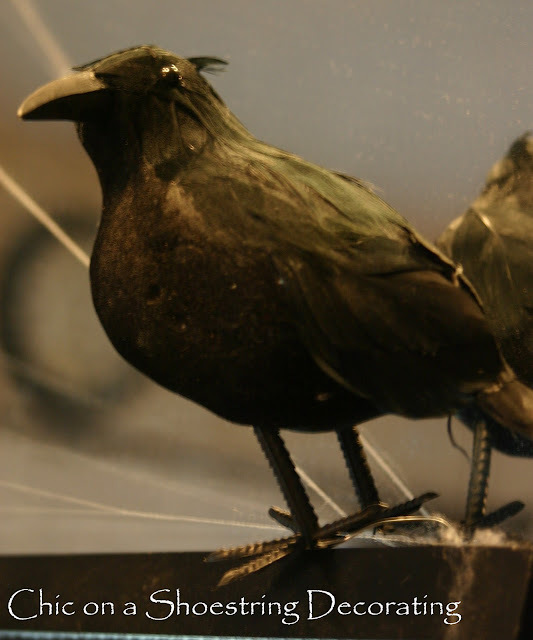 Crows are the best for Halloween too. Love, love, love the Dollar Tree crows. Much better than old Mr Fancy Pants. You did a terrific job with your mantel.